It seems lately that most major running publications (cough, Runners World, cough) have been posting a lot of articles on social media about the benefits of waking up early to go for a run. I say that lightly. The tone of most of these articles seems to suggest that early bird runners are the Marines, the Mod Squad, the elite of the amateur running community. Or maybe I am just being overly sensitive. I have written about this before and I am, after all, a proud and unapologetic evening runner and always have been. One of my favorite sunset photos, taken after a Tuesday evening 7-mile tempo run. I don’t dispute that running first thing in the morning can be enormously beneficial. I have had to do so for a number of reasons, chief among them that I live in a notoriously swampy town where the humidity will kill you first if the heat doesn’t. Waking up early to train for marathons is pretty much a matter of survival in the DC summertime, as it is in many parts of the country. In addition, on some of my busiest days at work, getting up early in the morning is sometimes the only chance I will have to get it done. In a town that works as hard as it plays, mornings are prime time. There are many other reasons for waking up with the birds: that feeling of having the world to yourself, the chance to clear away whatever is on your mind before it bogs down your day, having your whole day ahead of you and not having to worry about when to squeeze in a run, that spring in your step all day. I get it! But I’m going to let you in on a secret: you can get those same benefits from being an evening runner, too. Evening running doesn’t get as much love or respect as morning running does because there’s a sense of “go-get-it”-ness with anything that requires discipline. Just do it! No time like the present! No excuses! Time is money! But guess what: it takes the same level of discipline to take that first step out the door no matter what time of day it is. Morning runners can say that stumbling sleep-drunk out of the comfort of your nice warm bed to go for a run in the heat or cold is harder than going for a run at the end of the day, but I have to ask– how many times have you thought to yourself that you “should” do something at the end of your day and did so with as much energy as you would have liked? How many times have you stepped up to make a healthy, gourmet dinner for yourself and your family after a long day at the office when it’s easier to order in? Have you ever cancelled evening plans or skipped out on obligations because “gosh, it’s just been such a long day and I’m tired”? I thought so. Just like it’s not easy to get out of bed to run, it’s not easy to go for a run at the end of a busy day. Morning or evening runner, we each have the discipline to make the choice to run, we decide how dedicated we want to be, and both options are equally challenging. Running at sunset. Man, this pace run was BADASS. I have actually tried to wake up early to run because I can see the benefits. And I am capable of a great number of things, but I just cannot run in the mornings. For weekend long runs, I have to wake up at least 2 hours before I leave to hydrate and eat something and shake off the sleep fog. I don’t have that time on work days, so I just go. And because I am not mentally sharp, I have noticed that my performance takes a huge hit. I am more likely to run slower, with poor form, and to generally just not give a damn about running. Doing things like drills and adding some post-run planks or even stretching before or after feels like a chore or I skip it because I’m mad that I am awake in the first place. How is that enjoyable or healthy? It’s not. You get a barrier between work and home. I personally insist on a work-life balance. I have to have it, otherwise I bring my work problems home with me at the end of the day. Leaving work every day at close of business to go for a run ensures that I can clear my head about my work problems before I bring them into my personal life. You get to see the sunset. Ever thought of that? While we evening runners may miss the sunrise, we still get the benefit of a sunset. And you can enjoy it as long as you want instead of trying to time it just right before you have to get home and get ready for your day. You can sleep in and STILL get in your miles. Best of both worlds. This one just seems obvious to me, especially in an age when lack of sleep is a major health problem. Hills for breakfast? How about hills for happy hour! Pub runs, beer runs, will run for beer, post-run beer. There’s a theme here that doesn’t apply to the morning…or if it does you might have a problem. You have that spring in your step from looking forward to your post-work run. Some days, all I want to do is get out there and burn off my energy from the work day. More often than not, it’s what keeps me going. You can take your time instead of worrying about being on time. My runs don’t always go as planned. Sometimes a tempo run turns into an easy effort run instead. Sometimes I’m out there and realize I have more than 3 miles in me and I go 5, or I decide to do some form drills. With evening running, you have the freedom to vary it up and be spontaneous without worrying that you’ll be late for work. People are more likely to join you. This is great if you are just getting to know someone or you’re trying to get a friend into running or helping them with training. No one wants to be the person that says, “Cool, see you at 5AM!” Ugh, de-friended. The weather cools off in the evenings, you know. If you “only” get up in the mornings to beat the heat, keep in mind that your run might start off hot but will likely get cooler as the sun goes down. While I begrudgingly wake up early for long runs on the weekends, during the week, I don’t feel like heat is so much of a problem that I have to switch to mornings. Besides, running in the heat sets you up for success in a cold weather marathon. See, the heat can be your friend! Safety in numbers. Running at night gets a bad rap, but guess what? Running in the dark is scary any time of day. I’ve found that the trails are more populated in the evenings with other runners and bike commuters. Do you know anyone who wakes up at 4AM to go to work? Certainly fewer than those who commute in at 7AM or 8AM. You can sleep in actual pajamas and not your running clothes. Commenters on Running World’s Facebook post suggested sleeping in running clothes to make waking up easier. Seriously, morning runners? That’s a thing? How do you stay warm in breathable fabrics? Do you ladies sleep in your sports bra, too, or wouldn’t you have to change into it in the morning thus defeating the purpose of sleeping in your running clothes? Frankly, in my opinion, if you have to go to those extremes to get it done, you’re working too hard. The traffic has usually cleared off by the time you are done and heading home. No one ever thinks of these things, I swear! While you’re out running, let the crawlers sit in traffic and clear the road for you. Morning runners probably have a list that is equally as long and just as true as my own list of reasons, but the thing all of us in the running community need to remember about our fellow runners is that we each got it done. Did you get out of your warm bed and run? Check…badass. Did you resist the couch after a tough day at the office? Check…badass. If you got it done, no matter what time of day, you’re a badass. End of story. Bring your running clothes with you to the office. I have even left a few things at work under my desk in case I forget something. No excuses still applies to planning. Find a trail near your office or on the way home from it. When I lived in Nebraska in 2014, it wasn’t hard to jump in the car and drive to a local trail. Here in DC, you can access a trail from pretty much any point in the city. Set a time and stick to it. Just like morning runners set an alarm to wake them up, know your game plan ahead of time and stick to it. For me, COB = run time. Leave from work. Most of the time, I leave at close of business for a run and then come back for my stuff before heading home for the day. Just make sure it’s okay with your office or the building staff and carry your keys or key card with you if you have it. If anything work-related comes up while you’re running, you get the bonus of an endorphin high and a nice quiet office to get it done before leaving. My final tip: don’t forget your phone. Those sunsets can be spectacular. I wasn’t motivated to run tonight, but I was rewarded with a stunning sunset along the Potomac. Oh, I totally agree that being an evening runner also requires dedication and commitment. Things I don’t have in the evening, so I run in the morning. It’s way harder for me to run after a long day and I have tremendous respect for people who do because when I come home, the last thing I want to do is be back on my feet again. In my mind, running any time of day is a good thing. 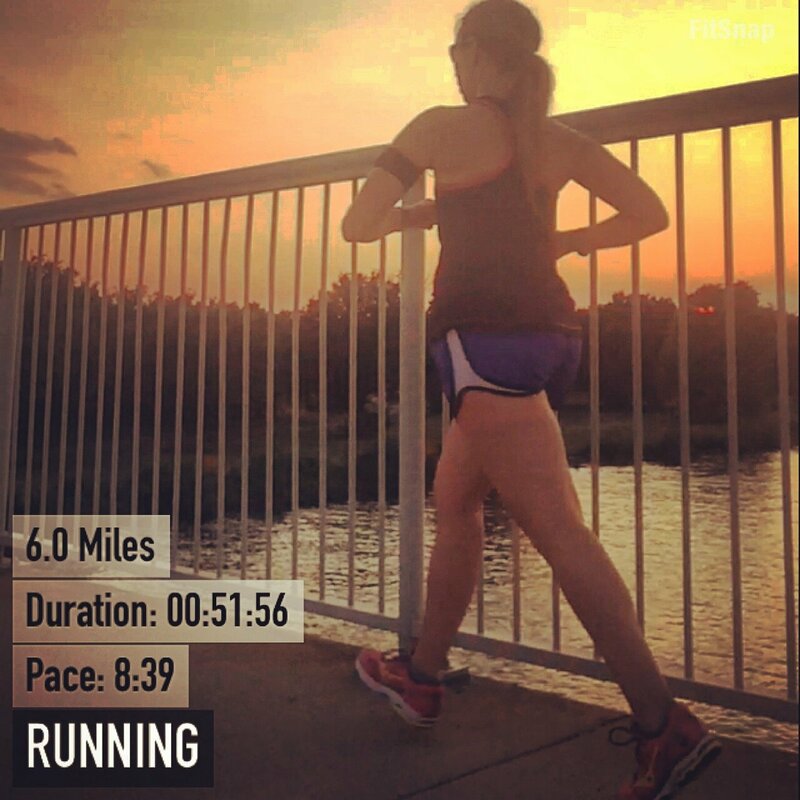 I am a morning runner…but I must confess…that I believe it takes more discipline to be an evening runner. The morning is my time exclusively. At the hour I’m out…nobody is ever going to require my presence or attention…for anything. That’s definitely not the case in the hours after the work day ends. There are any number of things that can arise to foil an attempt to get the miles in. People know you’re awake. They know you’re accessible…and they don’t think twice about asking for your involvement in something. To fend all of that off…every day of the week…??? I honestly don’t know how you do it.